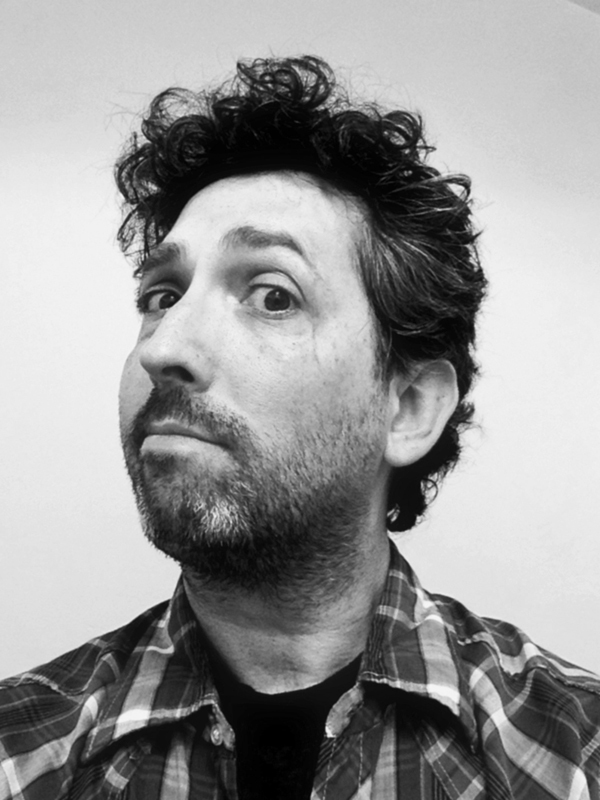 Meet David Vienna, Calm the F*ck Down author. Check out his own parenting blog, The Daddy Complex. A year and a quarter of a million shares later, after the post was picked up by the likes of Jezebel, Redbook, and HuffPost (while stirring up conversations on The Atlantic and The New York Post), David fleshed out his method into a brand new book. 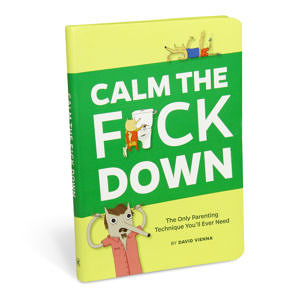 Calm the F*ck Down: The Only Parenting Technique You’ll Ever Need is coming soon and it’s guaranteed to keep you calm, cool, and collected. 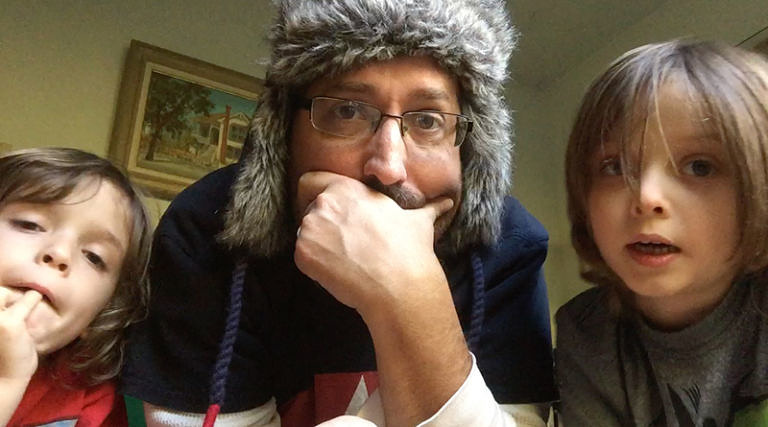 When he’s not writing for Huffington Post Parents, writing his next play, and managing the social realms of Dish Nation, he’s making hilarious videos with his twin boys, Wyatt and Boone (the still above is from his web series “Discussing News With My Kids”), and making us laugh with his super funny parenting blog, The Daddy Complex. 1. As someone who juggles and wears plenty of metaphorical hats, what’s a typical day like for you? What’s your daily routine? I don’t have a daily routine, just a never-ending series of surprises. Surprise! The dog ate some Lego bricks. Surprise! The boys have a cold. Surprise! I haven’t showered in three days. The only constants are my morning coffee and my evening cocktail. “Calm the F*ck Down: The Only Parenting Technique You’ll Ever Need” by David will be available in February. 3. You’re stuck on a desert island (sorry, that stinks). A. What three book titles would you wish magically appeared on said island? The Hitchhiker’s Guide to the Galaxy by Douglas Adams, The Complete Works of William Shakespeare, and Boatbuilding for Beginners (and Beyond) by Jim Michalak. B. A TV appears on the island, but only episodes of one show can play on it forever. What TV show would you choose to watch? Cop Rock. 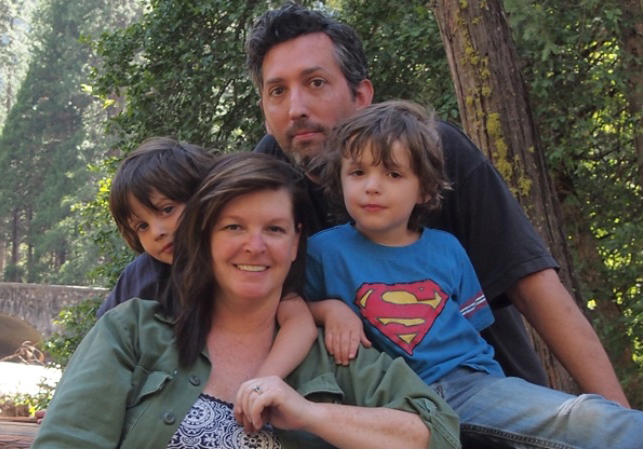 Family portrait: David, his wife, Larissa, Wyatt (left), and Boone (right). 4. Any hobbies outside of writing? One of my favorite hobbies is eating . . . Is that a hobby? 5. 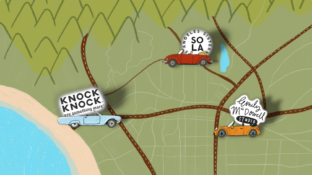 What’s your favorite Knock Knock product and why (other than Calm the F*ck Down)? As a parent, I find How To Traumatize Your Children incredibly useful. 6. We know you’re chock-full of parenting tips, but do you have any writing tips or writing words-of-wisdom to share with our readers? Don’t compare yourself, your process or your work to others. This also applies to clog dancing enthusiasts. 7. If you could cook a meal for a group of four people—either fictional or real—who would they be and what would you cook for them? Well, my first answer is “the four people would be me and my family and the dish would be fettuccine alfredo,” but since I do that all the time I’ll give another answer . . . Hmm . . . My guests would be Abraham Lincoln, Julius Caesar, Nikola Tesla, and Joan of Arc. I’d explain to them that the future holds many wonderful gifts and society has truly reached its peak, and then prove it by serving Cheetos and turducken. 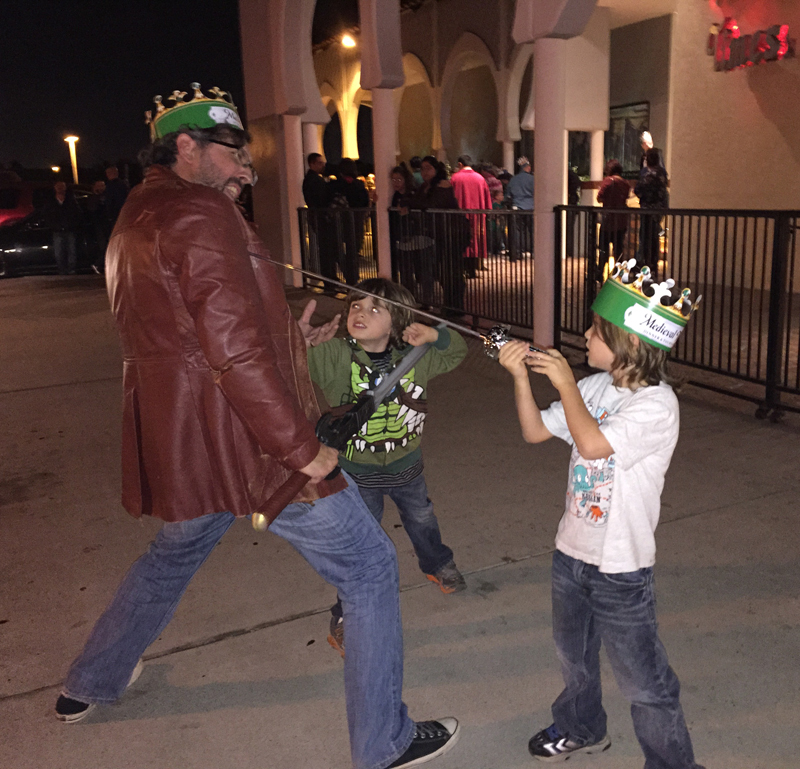 David, Boone, and Wyatt clashing swords. For other viral posts by David, check out How To Hang Out with Your Friends & Their Baby and his post Self Defense Against Misinformed Parenting Advice for HowtoBeaDad.com. I’m just here for the Cop Rock. I’d have to take the book, “How to Win Friends and Influence People” cuz being on a desert island is the only time I’ll ever be able to accomplish those two tasks. Funny stuff . . . refreshing to see someone take the lighter side of life!